If there is a chance that radon gas is entering your home, testing is the only way to know if radon is putting you and your family at risk for health issues, such as lung cancer. If the test finds a dangerous level of radon in the home then a radon mitigation system is required. Give us a call today to have your home tested or for an estimate for radon mitigation work. 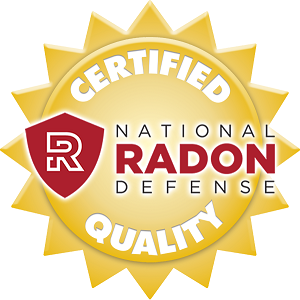 We offer professional radon services in O' Fallon, Belleville, Florissant, Wentzville, Warrenton and nearby. Radon is a natural gas created by uranium decay in the rocks and soil. The concentration level increases by ten times during the winter months. Homes with crawl spaces face a high risk with radon issues. Low-level radon exposure over time is actually more harmful than short, high-concentration exposures. Radon causes cancer similar to tobacco smoke and asbestos. It causes 15,400-21,800 deaths every year. Woods Basement Systems, Inc. removes the radon from your home by installing a sub-slab depressurization. The radon mitigation system is actually relatively simple to install and simple to understand. A radon depressurization vent pipes the radon up from the soil, up the pipe and safely away from you and your family. We install interior basement waterproofing systems which means if that you have our basement system installed we can connect the radon mitigation system alongside it so you don't need to have additional materials and costs added to the project. We can save you time, money and provide you with the radon mitigation system you need. We were amazed at the knowledge and service, crew was top of the line professional. They provided "BEYOND WOW SERVICE!" I really felt that your company was presented as professionals with experience and knowledge of what was needed. Ken did great job explaining why go do the thing you do to lower Radon as much as possible. Way beyond what the other company was planning on doing. We are repeat customers and we are continously satisfied with all work performed.Your company has very friendly and professional staff. Just wanted to thank your whole staff on how well I was treated. The office was great and the installation went perfectly. My biggest thanks goes to Ken for the way he explained EVERYTHING. Your radon system is not the cheapest but I know exactly what I got and why. Everyone knows that you get what you pay for and that is why I went with all of Ken's plan to fix my radon problem. Ken came to our house and was very professional, courteous, and made us feel very comfortable with the whole process. He took time to explain everything to us, showed us pictures, and answered all of our questions. He wonderful to work with! We are confiedent that the work will be done right! Not only do you want a trusted radon mitigation system but you want a trusted contractor to install it. Since 1986 Woods Basement Systems, Inc. has been serving homeowners in Decatur, Ballwin, Belleville, Champaign, St. Peters, Saint Louis and nearby. We don't only work in homes but have had the opportunity to service schools, condos, restaurants, apartment complexes, churches and other professional buildings. We are a locally owned and operated family business that has grown to be a leader in the industry. We realize how important it is to have a quality system providing safety and peace of mind in our homes. You can expect us to have that same mentality in your home. Give us a call to get started. Woods Basement Systems, Inc. also provides multifamily radon mitigation in compliance with the HUD Radon Policy. If testing confirms radon levels above 4 picocuries (pCi/L), mitigation must be performed by a radon professional reduce the level of radon gas in the air to a safe amount.